To use Apigee Edge, you need an Apigee account. In this step, you'll create a free evaluation account. Enter your name, email address, and a password. Be sure to read and accept the terms of service. Apigee sends you an account confirmation. In the confirmation email, click the account verification link. Log in with the email and password that you used to sign up. 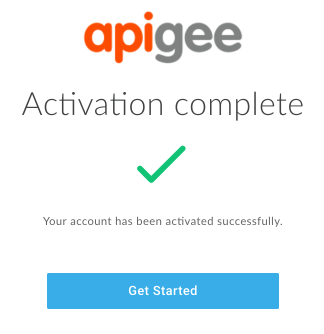 Apigee activates your new account. This can take several minutes. 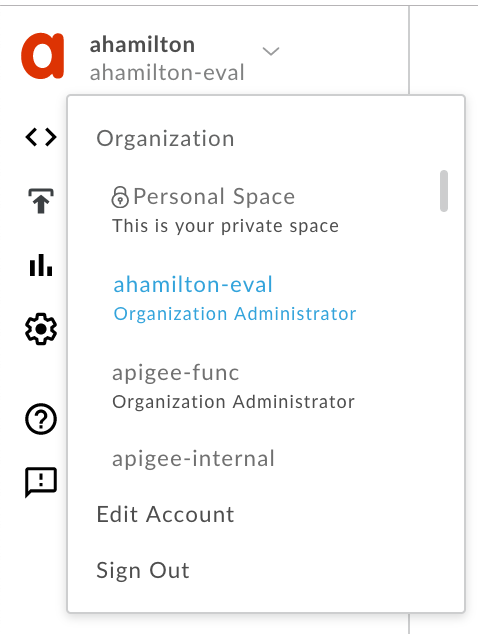 Click Get Started and you are logged in to the Apigee Edge management UI. You have a new Edge account in a newly-provisioned "organization". An organization is a container for your API proxies and the environments you deploy them to (either "test" or "prod"). You use the organization name in your calls to the API proxies. Figure 1: In this example, the name of the organization is "ahamilton-eval". Your ability to add new users may depend on your account type. For more information, see Apigee Edge Pricing. The name of the organization is autogenerated by Apigee based on your email address (minus the @domain). For evaluation accounts, it will end with "-eval". You can see the name of your new organization in the UI's user profile drop-down menu (see Figure 1). If necessary, Apigee adds a 5-digit random number to the organization name to ensure that it's unique. For example, if your email address is ahamilton@example.com, the organization name might be auto-generated as "ahamilton-eval" or "ahamilton-12345-eval". When you create a new account, your email is automatically added to the Organization Administrator role. That means you can do just about everything in your organization.